James Forman Jr.’s new book tells an all-too-hidden and tragic part of the story of the rise of the racist mass incarceration state in the United States. Forman is the son of the leading 1960s Civil Rights activist James Forman. He is also a Yale University Law professor, a first-rate historical researcher, and a former public defender in then majority black Washington, D.C., during the 1990s. Focusing largely on Washington, Forman traces the fateful role that pro- “law and order” black Americans—chiefly black mayors, city council persons, police chiefs, judges, prosecutors, and police officers—played in the creation of the wars on crimes and drugs that created contemporary racially hyper-disparate mass imprisonment and criminal marking. Along the way, Forman shows, black elites and voters abandoned the long “black arms tradition” (a reflection of black Americans’ longstanding struggle for self-defense against violent and armed white supremacists) by embracing strict gun control measures. Many black police proved every bit as willing as their white counterparts to harass, surveil, and abuse the black urban underclass. The crackdown and lockdown occurred with considerable support from the black population, which demonstrated punitive attitudes toward drug and other offenders in their communities. This did not happen, Forman shows, because black America was loaded with white-pleasing, racially self-hating “Uncle Toms.” To the contrary, Locking Up Our Own shows how black Americans “advocated tough-on-crime measures in race-conscious terms” that bore the imprint of the long struggle for black civil rights and equality. Many prominent black leaders worried that the gains of the civil rights movement were being undermined by lawlessness, drug addiction, and chronic black on black crime. Confronting skyrocketing murder rates and rampant, all too open drug selling (producing a deadly heroin epidemic in the 1960s and the crack cocaine scourge in the 1980s) in black communities, they thought they had no choice but to join the law and order crusade. Black America didn’t want a racially disparate war on drugs and crime, one that disproportionately targeted blacks in a nation where whites were and remain every bit as likely as blacks to use illegal drugs and in which whites have far access to political and legal clout to avoid prosecution and harsh sentencing. Blacks also didn’t want a war on drugs and crime in and of itself. They wanted the war coupled with a war on poverty, joblessness, and racial injustice. To paraphrase the late French sociologist Pierre Bourdieu, they wanted help from the social-democratic and egalitarian “left hand of the state hand” along with the iron fisted and more repressive “right hand of the state.” They did not anticipate that only the right hand was forthcoming. Amid this heartbreaking irony, many black elites have continued to advance the endemic locking up and criminal branding of the black urban underclass. The nation’s first black Attorney General made his mark as Washington’s first black chief prosecutor by advancing mass pretext policing (mass frisks, stops, and arrests on minor or made-up and discretionary police grounds) in black neighborhoods. The nation’s first black president Barack Obama severely constricted his tepid late-term steps toward criminal justice reform by ruling out any concern those arrested and sentenced for technically violent offenses. More than half the nation’s nearly one million black prisoners are behind bars on violent charges. Locking Up Our Own ends with a moving story of how Forman worked with an older black crime victim to convince a black judge to let one black young male violent offender avoid incarceration. By last report, the young man had become employed in construction. Such stories, rooted in Forman’s experience as a public defender, help make this book a gripping and convincing read. The author skillfully puts a heartfelt human face on the difficult story he tells. If there’s anything missing from this book it is a discussion of how persistent residential segregation by race has fed black support for the aggressive policing and harsh sentencing. The black middle and professional class lives in much greater immediate proximity than its white counterpart to the deeply impoverished and crime-prone black underclass. 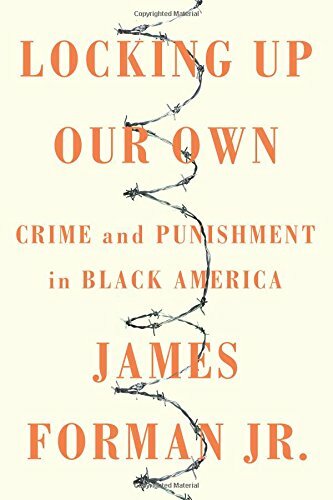 Still, Locking Up Our Own is a compelling and indispensable volume for those who want to get the whole story on the rise of the “the New Jim Crow”—a story that must include serious attention to class and other fractures within black America. Paul Street's most recent book is They Rule: The 1% vs. Democracy. He is the author of six other titles, and is an independent researcher, journalist, historian, and speaker. His articles, reviews, interviews, and commentaries have appeared in numerous venues.